Asheville is a historic and charming city in North Carolina, nestled into the Blue Ridge Mountains. It is conveniently located near Great Smoky Mountains National Park and the Blue Ridge Parkway, and has many charming shops and restaurant. Asheville’s brewery and music scene is thriving, and the city is also home to a wealth of choices for accommodation. There is a plethora of beautiful inns, hotels, and B&Bs situated on quaint and lovely properties with historic buildings and gorgeous gardens. Each of the destinations on this list is comfortable and unique, with dedicated staff members, delicious food, and an environment that simply reeks of that famous Southern hospitality. 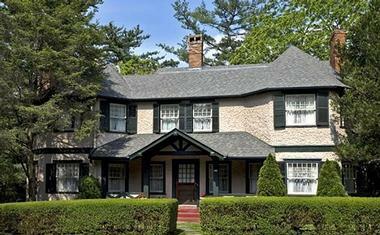 The Biltmore Village Inn is located within a historic Queen Anne Victorian home that is over 120 years old. 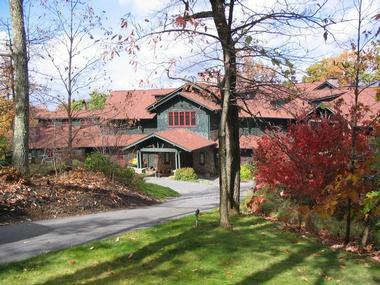 Each of the seven rooms in this bed and breakfast inn are unique, with options ranging from king-sized beds, fireplaces, Jacuzzi tubs, wine coolers, stunning mountain views, and even a cottage suite with two bedrooms, located in the carriage house. The rooms are all luxurious but comfortable, with designer bath products, coffee bars, and free Wi-Fi. Each morning, a delicious breakfast of coffee, fresh baked muffins, cheese, fruit, and a seasonal hot meal option is served in the beautiful dining room or on the serene wraparound porch. 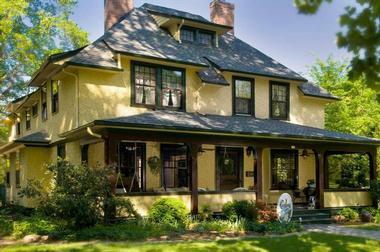 This cozy colonial farmhouse is located in a historic district of Asheville and is within easy walking or driving distance to many of the city’s attractions. Applewood Manor has six guest rooms with private bathrooms, large relaxing porches, a formal dining room, music parlor, and living room, all for the enjoyment of its guests. In the morning, the inn offers a rotating selection of baked goods, fresh foods, and hot breakfast. Guests staying at the Applewood Manor can choose from a number of packages, which have options to include baskets, flowers, and refreshments in-room, as well as tickets to Asheville attractions such as the Biltmore Estate, horseback riding, and hiking in the Great Smokies. 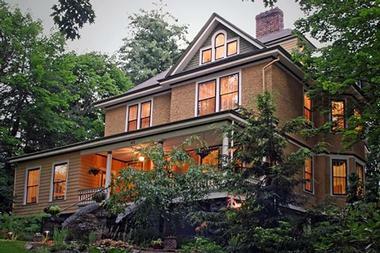 Hill House is a lovely 1885 home that is now a bed and breakfast, located just a short walk from downtown Asheville. With high ceilings, elegant private bathrooms, four-poster beds, and a big wraparound porch that is perfect for relaxing or enjoying a cup of coffee, Hill House makes its guests feel right at home. Breakfast each morning includes fresh French press coffee, local eggs and foods, fresh fruit, meats, cheeses, and more. The ten rooms at Hill House all include plush bathrobes, seating areas, Wi-Fi, central air conditioning, flat screen TVs, and all-natural bath products. The Black Walnut Bed and Breakfast is a comfortable inn located just half a mile from downtown Asheville, in the historic Montford district of the city. From 8:30am to 9:30am every morning, a full three-course breakfast is served that includes award-winning homemade baked goods, fresh fruit, and anything from eggs Benedict to waffles topped with bananas Foster. From 5:00pm to 6:00pm each day, an afternoon tea is served, and guests can enjoy a hot beverage as well as some fresh pastries and light appetizers. Each of the eight guest rooms has its own private bath, most have working fireplaces, and two of the rooms, located in the carriage house, are pet friendly. This dog-friendly and lavish bed and breakfast is located conveniently close to many of Asheville’s attractions, including the Biltmore Estate and the scenic Blue Ridge Parkway. The Abbington Green Bed and Breakfast Inn is beautiful inside and out, with award-winning English-style gardens, where guests can take a stroll or enjoy a book or a cup of tea. The vegetable garden on site even features in many of the B&B’s morning meals, which all consist of fresh and local ingredients served on crystal and fine china. Guests at Abbington Green can choose from a basic room all the way up to a lavish suite. 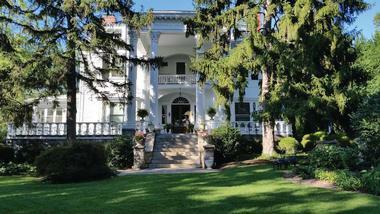 The massive mansion that houses the Albemarle Inn was built in 1909 in the Greek revival style of architecture. The splendor of the white pillars, stone patio, and the surrounding greenery all contribute to the vision of opulence. 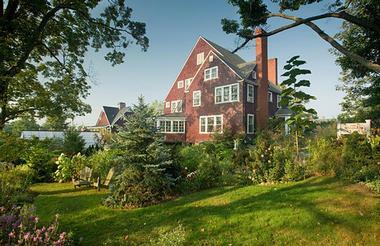 Albemarle Inn has eleven guest rooms, each with unique and different features. Each morning, a three-course breakfast is served on the sun porch, or by the fireplace in the dining room during the colder months. The inn is a perfect destination for events and weddings, and the romantic setting is perfectly suited for a couples’ getaway. Beaufort House Inn is located within an historic 1894 Queen Anne Victorian home that has been lovingly renovated into a peaceful getaway for guests. Relaxing on the hammock strung between two large trees in the yard, sipping a cup of coffee on the porch, and strolling the gorgeous gardens are just a few of the things guests can do, and that’s just on the property. Beaufort House Inn is located near many of the breweries, music, and shopping downtown. Each evening, the Beaufort offers a complimentary social hour, complete with wine and local beer, and every morning, guests will enjoy a two-course breakfast served by candlelight out on the porch. 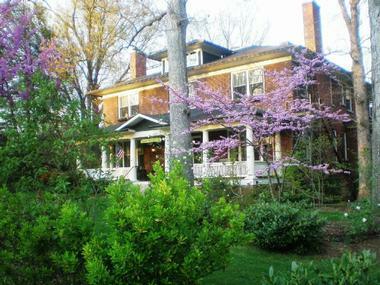 The warm yellow walls of the Carolina Bed and Breakfast, surrounded by the colorful flowering trees and plants in the yard, give this place a comfortable and inviting aura. The gardens that surround the house are lovingly tended to, and keen guests might even recognize the use of some of the vegetables and herbs from the garden in the delicious meals that are served each day. The Carolina Bed and Breakfast uses locally sourced foods and ingredients, and offers a daily social hour with complimentary beverages and snacks. The B&B has comfortable, cozy lodging for its guests, with king or queen-sized beds, in-room fireplaces, Wi-Fi, and private washrooms. 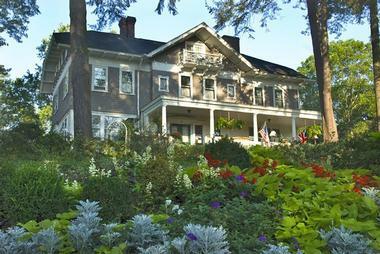 This historic inn, built in 1889, offers an intimate and romantic destination for guests traveling to Asheville. With classic, tastefully decorated rooms that feature four-poster beds and working fireplaces, and beautiful, cozy common areas for lounging or socializing, the WhiteGate is within walking distance from downtown Asheville and is conveniently located near a number of attractions. Each morning, guests will enjoy a fresh, three-course, farm-to-table breakfast featuring freshly baked goods, hot entrees, and delicious coffee. From a massage at the spa, a long relaxing soak in the whirlpool Jacuzzi tubs, or even a specially prepared picnic basket for a memorable meal out in nature, the WhiteGate offers a number of options for its guests to have a great holiday. At Pinecrest, the day starts with breakfast, served at 9am and consisting of fresh coffee, homemade breads, muffins, and pastries as well as hot entrees like waffles, quiches, or frittatas. After a long day exploring the Biltmore Estate, the Great Smokies, or downtown Asheville, guests can return to the Pinecrest for a delicious beverage and a dessert that is freshly made in house. At night, the Pinecrest’s five guest rooms are all comfortably furnished, with luxury sheets and bath products, private bathrooms, cozy bathrobes, and even fresh flowers and delicious chocolates. 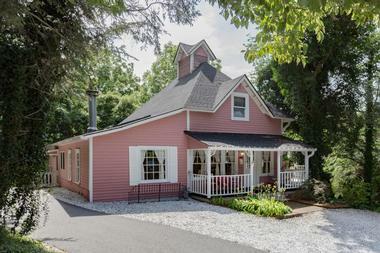 The Cedar Crest Inn is located in a pretty little pink house just three blocks from the entrance of the Biltmore Estate. 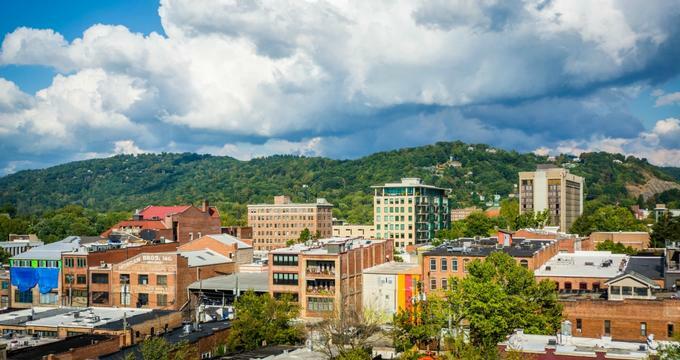 It makes a great location for anyone visiting the Asheville area as it is quite close to many of the city’s attractions, from the River Arts District to the Blue Ridge Parkway. The Cedar Crest Inn offers many options for guests of all budgets and preferences, from a Victorian-style room to a one-bedroom modern apartment located in the old stables. There are also rooms available in the cottage that are pet friendly. Breakfast is served each morning with an open schedule, and guests can choose to eat at a private table or socialize with other guests in the family-style dining room. Sourwood Inn provides its guests with a chance to experience the beauty of the Blue Ridge Mountains in a peaceful, natural setting. The inn is built from stone and wood and lies on 100 acres of beautiful land, but is still only an 8-minute drive from downtown Asheville. Guests will enjoy a full breakfast each day of eggs, coffee, and rotating items like blueberry French toast before heading off to enjoy everything that Asheville has to offer. Upon their return, they will find a cozy, rustic room awaiting them, with a comfortable bed that is sure to offer a good night’s sleep in preparation for another day of exploring. 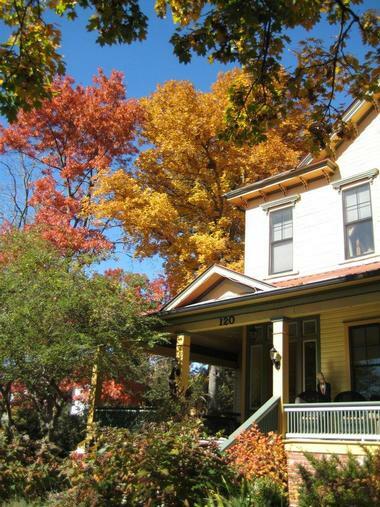 The Aberdeen Inn is a delightful bed and breakfast located in an historic home on a small hill, surrounded by gardens, trees, and other peaceful greenery. Guests can choose to stay in the main inn, or in the cottage, a two-room accommodation that offers privacy and cozy charm. 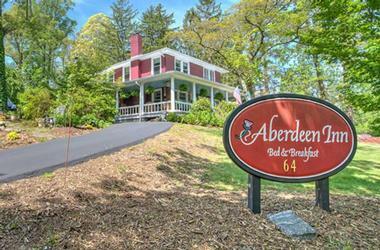 The Aberdeen Inn offers complimentary wine, beer, and other beverages to its guests, free Wi-Fi, and rooms with comfortable beds and fluffy bathrobes. Each morning, guests will also enjoy a full gourmet breakfast consisting of pastries, bread, and egg entrees as well as hot coffee or tea. Hotel Indigo is located in a high rise building right in the heart of downtown Asheville, so guests are never more than a few steps away from all the music, food, shopping, and breweries that the city has to offer. With almost 100 guest rooms and 16 luxury penthouse suites available for rent, Hotel Indigo will meet its guests’ every need. The hotel has a bar and kitchen and also offers room service. There is a fitness room, meeting space, concierge service, and valet parking. 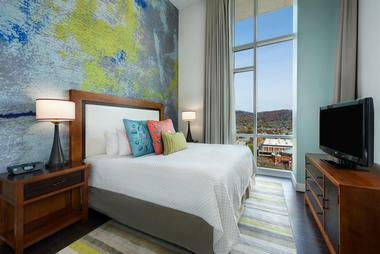 Guests will also enjoy spacious, comfortable rooms with queen-sized beds and hardwood floors. The Omni Grove Park Inn is a beautiful hotel with views of the Blue Ridge Mountains, and is located just a few miles from downtown Asheville. The hotel has over 500 guest rooms for visitors to choose from, with options for suites, penthouses, and even a private floor that caters to adults only. It is home to an 18-hole golf course, three outdoor tennis courts, an indoor pool, and a subterranean spa. The rooms are stylish and spacious, with king or queen-sized beds, plush duvets and pillows, and options for guests with ADA needs. 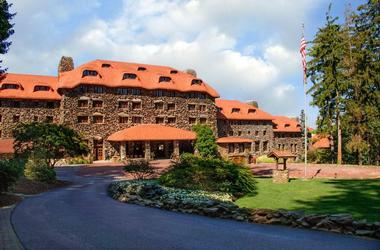 The Omni Grove Park Inn is also home to five on-site restaurants, a cafe, and three bars. 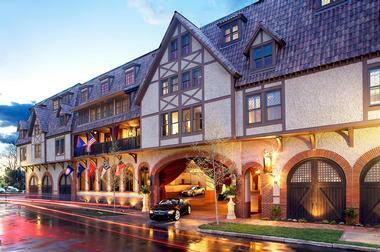 The Grand Bohemian Hotel is a massive Tudor-style structure inspired by classic European hunting lodges. Rooms feature plush velvet headboards, sleek furnishings, and comfortable bedding with touches that reflect the hunting lodge theme, such as paintings of forests and lighting fixtures made of antlers. Guests can dine at the hotel from the Red Stag Grill, which also has a bar and hosts live music in the evenings. There is also a spa and an art gallery on the premises. The Grand Bohemian has plenty of event space, which is perfect for weddings, conventions, meetings, parties, or other large events. This beautiful home was built in 1898, with stained glass windows, fireplaces, and a gorgeous tiger oak staircase. A stay in one of the five beautiful guest rooms at The Lion and the Rose, which is one of the oldest operating inns in the Asheville area, will include comfortable bedding in a luxurious room, each with its own personality. 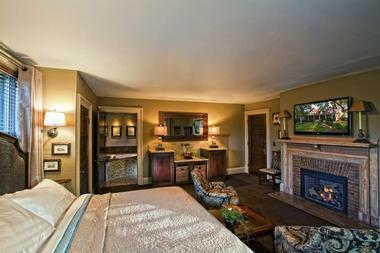 The inn offers free Wi-Fi, luxury bath products, premium television, and a DVD library. Each morning, guests can enjoy a gourmet breakfast, coffee service, and a fully stocked pantry of snacks and drinks that is available 24/7. The Inn on Montford was designed by architect Richard Sharp Smith, one of the most famous area architects, who supervised construction of the Biltmore Estate. 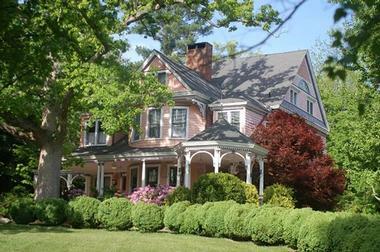 The Inn on Montford is located within a beautiful, historic pink house with a large front porch. The eight rooms and suites in the bed and breakfast all have king-sized beds, Jacuzzi tubs, fireplaces, air-conditioning, HDTV, and Wi-Fi. A three-course breakfast, complete with coffee and tea service, will be delivered to each room every morning at 9:00am. Behind the main house, guests traveling with their pets can stay in the Griffin Cottage, formerly the carriage house of the estate. Travelers looking for the ultimate destination for a relaxing holiday should look no further than ASIA Bed and Breakfast Spa. 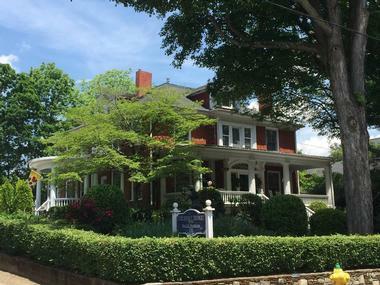 Located just a few blocks from downtown Asheville, this small bed and breakfast offers an intimate experience with a maximum of ten guests in the hotel, so that each guest can receive personal attention and have a relaxing, wonderful experience. The inn encourages late mornings spent sleeping in or lounging in a morning sunbeam, with breakfast served later than at the standard B&B. Rooms are comfortable and unique, with an occupancy maximum of two guests per room. Children under the age of 15 are not permitted. Bent Creek Lodge is perfect for visitors who wish to experience the beauty of the Great Smoky Mountains and the Blue Ridge Parkway. 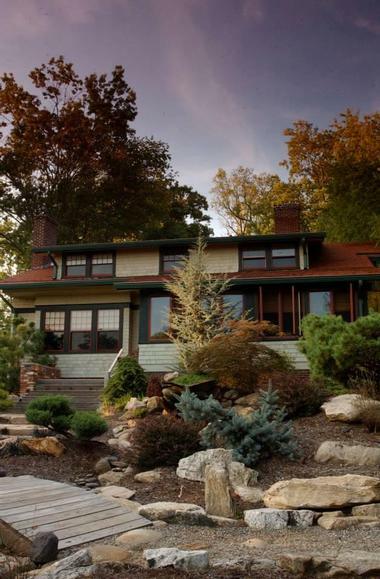 This gorgeous bed and breakfast is located in a secluded mountain wood and has direct access to several scenic hiking trails, but it is also only located a quick 10 miles from downtown Asheville, giving visitors the best of both worlds when it comes to location. The lodge itself is warm and comfortable, with fires crackling in the stone hearths, rustic wooden furniture, and large, open decks that overlook the mountains. The staff is happy to serve a gourmet breakfast each morning, and is also available to help guests plan their day’s activities with the help of an insider’s opinion of the region. The seven guestrooms in this colonial brick house, built in 1915, are comfortable and in a friendly environment that oozes Southern hospitality. Just a mile and a half south of the shops, restaurants, and nightlife of downtown Asheville, Sweet Biscuit Inn is perfectly located for a fun and enjoyable vacation in Asheville. The rooms feature high ceilings, queen or king-sized beds, private bathrooms, and Wi-Fi. Sweet Biscuit Inn also has a lovely front porch where guests can sit and enjoy the gorgeous North Carolina weather, and serves gourmet three-course meals in the morning, prepared by a chef who trained in France and uses those influences often in her cooking. The Innkeepers at Asheville Seasons, a charming bed and breakfast located in Asheville’s historic Montford district, are dedicated to giving their guests the best possible experience. Those staying at the Asheville Seasons will enjoy tasteful and comfortable rooms with organic bath products and cozy bedding, mornings full of fresh hot coffee and delicious home-cooked breakfasts, and a homelike atmosphere with board games and music. To encourage socialization, rooms do not contain a television unless by request. There is even a guest pantry that is open 24 hours and kept fully stocked with drinks and snacks for guest convenience. The Reynolds Mansion is one of only a few surviving brick mansions in the region from before the American Civil War. 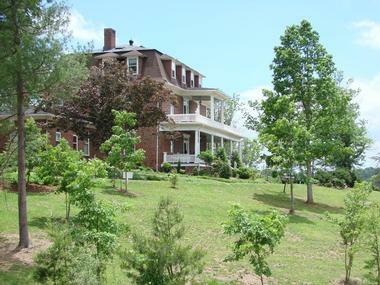 It was built by Colonel Daniel Reynolds in 1847, and the property once encompassed over 1,500 acres of land. Today, the three-story brick home lives on as a bed and breakfast, where guests can enjoy a lavish environment and the company of the friendly innkeepers Michael and Billy as well as their two bulldogs, Rhett and Scarlett. Guestrooms feature historical furnishings like crystal chandeliers, four-poster beds, and working fireplaces, and each has its own private bathroom. Suites are also available, which include private decks, extra beds, and sitting areas.